More than ever I wanted my parents to have a special 60th anniversary. Sixty! – for heaven’s sake – they have been married to each other, taken care of each other, put up with each other, for sixty years – 720 months, a zillion weeks – a long, long time. June 1953 when they exchanged their wedding vows was a rainy wet month in southern Alberta – they sloshed through the muddy church yard hauling up the bride’s dress to keep it clean. June 2013, the year of this diamond anniversary, has involved epics floods that have devastated their city of Calgary, Alberta. For months, myself and my four siblings have planned a family celebration of our parent’s wedded bliss involving their children and spouses, the grandchildren and spouses, and the two little great- granddaughters all meeting at our cottage on Shuswap Lake in B.C. 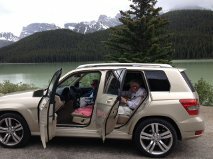 – a seven hour drive from Calgary. When I said, “hey, just pack a bag and we’ll make a little trip of it,” I had never fathomed we’d be housing evacuation victims, and glued to network forecasts on the country’s number one highway being washed right out with storming mad flood waters. As distracted as we were with the hardships going on around us – property destroyed, power out, transportation a mess – it seemed my eighty-three and eighty-four- year- old mom and dad still deserved to have us rally to mark the occasion, but there was that matter of the main highway having vanished under muddy debris. We waited it out a day and then I told the folks we would scout out an alternate route. And there we were a few hours later jammed packed with a line of transport trucks all headed north when we all needed to go west. We met up with fifty troops of army reserves returning from natural disaster duty – at the A and W in Red Deer, then struck off west finally over miles of land that couldn’t have been more lush as the rain came down again. Reaching the Rocky Mountains we were forced to go south now and finally, after five hours of detour, were back to the number one. Tell me about your honeymoon, I said to my mom, as the sun crested a peak and my dad slept in the back seat. 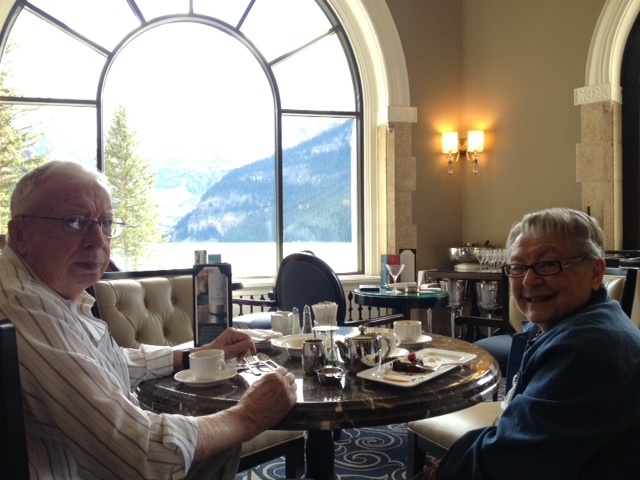 We pulled into the iconic Chateau Lake Louise for a late, late afternoon coffee. The waiter there, learning it was the 60th anniversary didn’t charge for the two desserts we shared, and bid them a respectful (awe struck) congratulations before we pushed on a mere half hour further to the Kicking Horse lodge in Field, British Columbia, for a evening meal in the railway town before bedding down for the night.